Ghost Town Games is going to have us all cooking up a storm once again. As a sequel to one of the most deceptively bombastic games ever made, Overcooked 2 is shaping up to be a continuation of the original game’s food-themed stress simulator. Related reading: A review of the original Overcooked! The original Overcooked holds the distinction of being a rare game that’s properly comedic. I don’t mean so in the “our game has jokes in it” approach that stuff like Borderlands takes, or the “unintentionally hilarious things will happen” approach as in Far Cry – I mean that the mechanics are designed specifically to make the player laugh, and best of all, Overcooked did that in a local multiplayer context. Each level came packed with hilarious design choices, such as rats which stole ingredients when you weren’t looking, to earthquakes which would separate your kitchen into two segments. There are a few additions to the formula that the second game adds, but nothing too unfamiliar. You can now throw ingredients across the restaurant in an attempt to be more efficient, which will only add to the chaos of it all when people start blindly throwing things at one another in a panic, trying to get the last few orders in before time is up. Plates can be placed on-top of food now for a bit of user-friendliness. The graphics are clearer with more fluid animations to let you better know exactly what each player is doing. There’s also the addition of online multiplayer which is odd, considering the game’s clear couch co-op appeal. Ultimately, the big advantage that Overcooked 2 gets is that it gets to play with the assumptions of people who have mastered the first game. The original title borrowed from the ludic language of time and resource management games like Diner Dash – the tasks were simple enough that they could be understood at a glance, while the level design’s job was to punish players who barrel into levels without a carefully thought out game-plan. 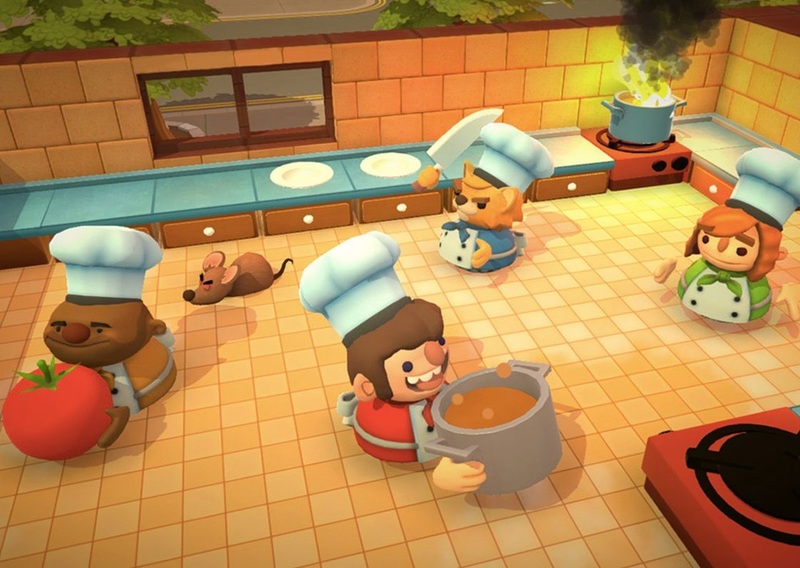 Meanwhile in Overcooked 2, the levels seem dead set on punishing people that carefully think out a game-plan – the levels turn the logic of Overcooked 1 onto its head and are sure to put your teamwork skills to the limit. A great example of this is the fire extinguisher – Overcooked 1 was akin to real cooking in that fire doesn’t spread uncontrollably unless you’re very bad at your job. There are levels in Overcooked 2 that mandate the use of the extinguisher as a tool just as integral as your chopping board or fry pan, and when I picked it up for the first time I honestly had forgotten how it worked - covering my teammates in white foam while I panicked had me in stitches. 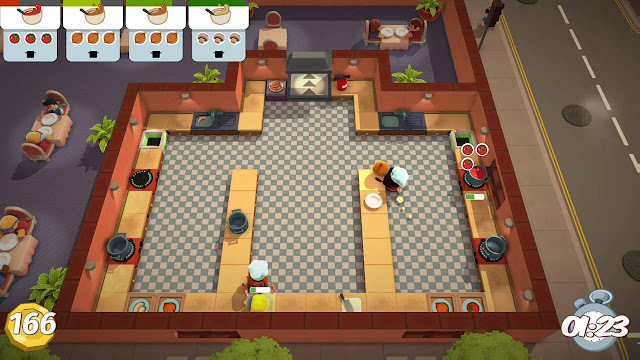 The demo levels of Overcooked 2 show off a greater willingness to play with randomness, so that players are forced to improvise. There are also the occasional dynamic levels which ask you to adapt your game-plan on the fly – these two additions alone make the first game’s levels look as regimented as a military exercise by comparison. Whereas I’d brief my friends about each level’s gimmick in the first game to try and psyche them up for the challenge ahead, there are some levels in the second which I’d downplay in order to see the abject horror in my teammate’s eyes when they realise what they’re required to do. For this long awaited sequel, Ghost Town Games seem to be firing on all cylinders - Overcooked 2 is sure to bring more of the laughs, tears and screams the original did. Whether you’ve mastered all the first game’s levels or you’ve never stepped foot into the digital kitchen, it’s worth your while to check out this game – it’ll be some of the best multiplayer fun you’ll have all year.